DPCI provides Drupal consulting to DNAinfo to create the New York Guide, a Website that provides business listings and deals for New York City neighborhoods. Digital Network Associates (DNAinfo) is a digital news organization that covers stories vital to Manhattan's local communities via its Website, www.dnainfo.com. DNAinfo.com combines original content with news aggregation services to give its audience all the best news from Manhattan’s individual neighborhoods. DNAinfo envisioned the New York City Guide, a Web portal for customers in the five boroughs to access neighborhood business listings and local deals. 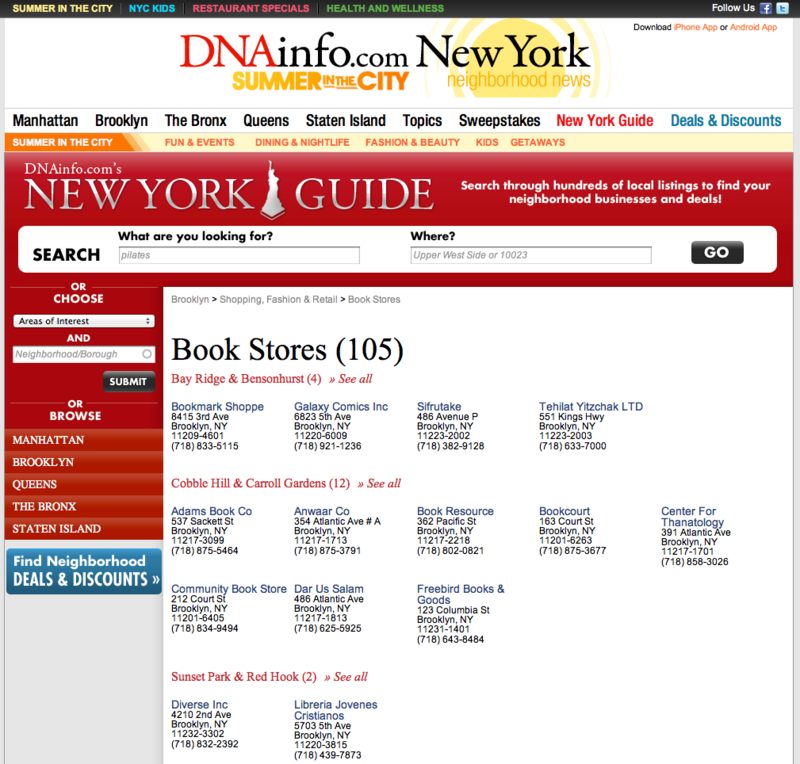 For DNAinfo, the Guide would generate revenue from the sale of enhanced and premium business listings to local business merchants, featured locations on dnainfo.com news pages, coupon offerings and other add-ons. An underlying Drupal Web content management system would structure the content for optimal indexing by major search engines and produce highly discoverable information for consumers new to dnainfo.com. There are a number of well-known Websites that provide business listings both nationwide and specific to New York City. DNAinfo was aware that it was entering a crowded online listings market space, but with an average of 1.6 million visits and 8.4 million page views per month, DNAinfo believed it was well-positioned to capture the attention of local New York City merchants trying to reach their intended consumer base. 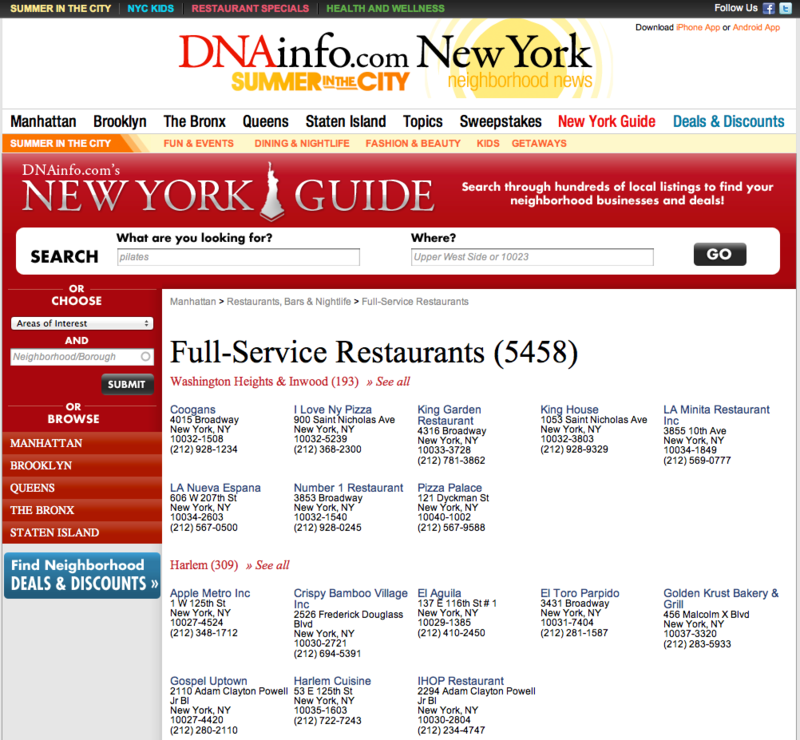 DPCI provided Drupal consulting services to design a solution that would meet DNAinfo’s needs for the New York City Guide. First, DPCI helped DNAinfo stakeholders clearly define and document their business strategy and corresponding business requirements. DPCI next performed a heuristic analysis of cohort sites to determine basic functionality that exists across the top business listing platforms. Following this analysis, DPCI worked with DNAinfo stakeholders to elicit and document solution requirements, which include functional, nonfunctional, and transition requirements. Once the solution requirements were validated and approved by DNAinfo staff, DPCI translated the requirements into technical specifications including system architecture, identification of core and contributed Drupal modules, existing module enhancement, and custom module development. Based on the technical specifications, DPCI’s Drupal development team designed an intuitive and user-friendly interface for DNAinfo’s New York City Guide. DPCI designed the system so that it was simple for merchants to acquire a free, enhanced, or premium listing package. The new system includes a coupon solution whereby merchants can fill out a simple form with information about the deal and the expiration date. Merchants can also categorize the coupon, add keywords and key phrases, upload a graphic, and manage the coupon (or series of coupons) in a self-serve manner. The Guide Website provides information on more than 300,000 local businesses. DPCI developed a solution to import listings data into Drupal along with geolocation and keyword/categorical info about each individual business. Using integrated analytics, DNAinfo sales associates have access to data on the number of page views for each merchant listing. To assist with lead conversion, DPCI developed Web services to connect with Salesforce, DNAinfo’s Customer Relationship Management (CRM) system. As part of the integration, DPCI created a Web form that allows an individual to claim a merchant listing. Once the claim is verified, the listing data and the record owner’s data are sent to Salesforce, initiating the record for processing through the Salesforce workflow. 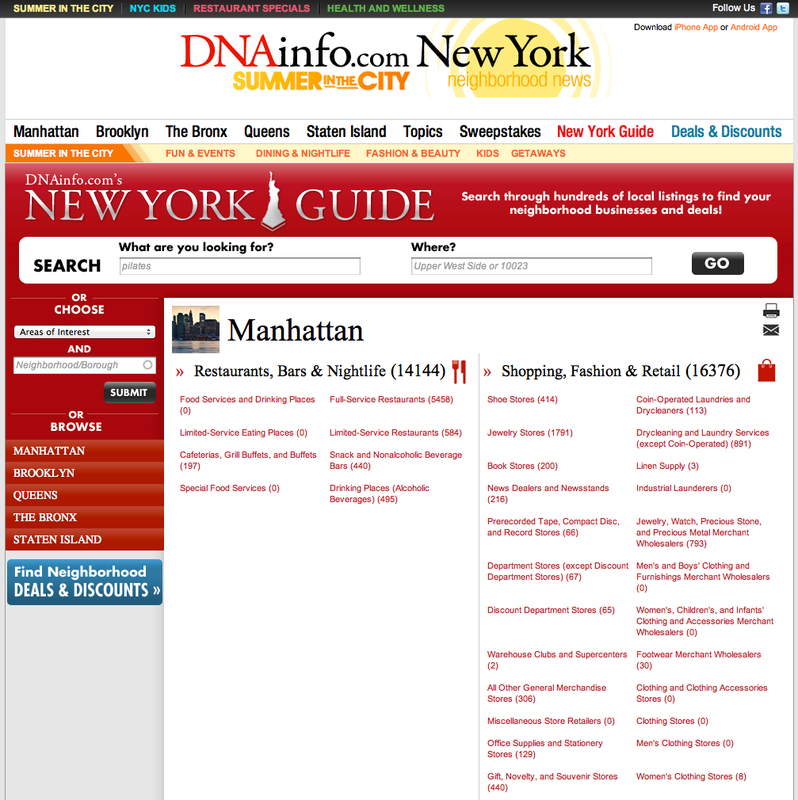 Finally, DPCI configured a news feed to showcase featured updates from www.dnainfo.com on the New York City Guide Website. 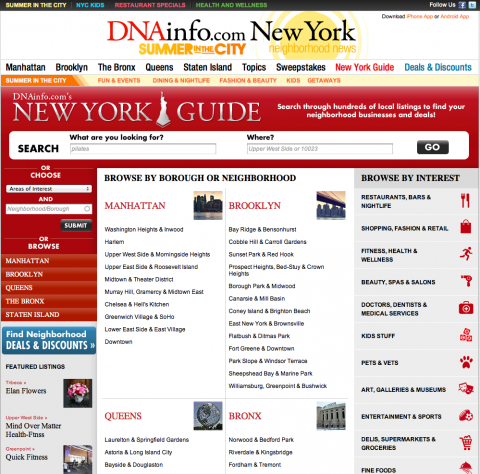 DNAinfo launched the New York City Guide powered by Drupal in May of 2012. 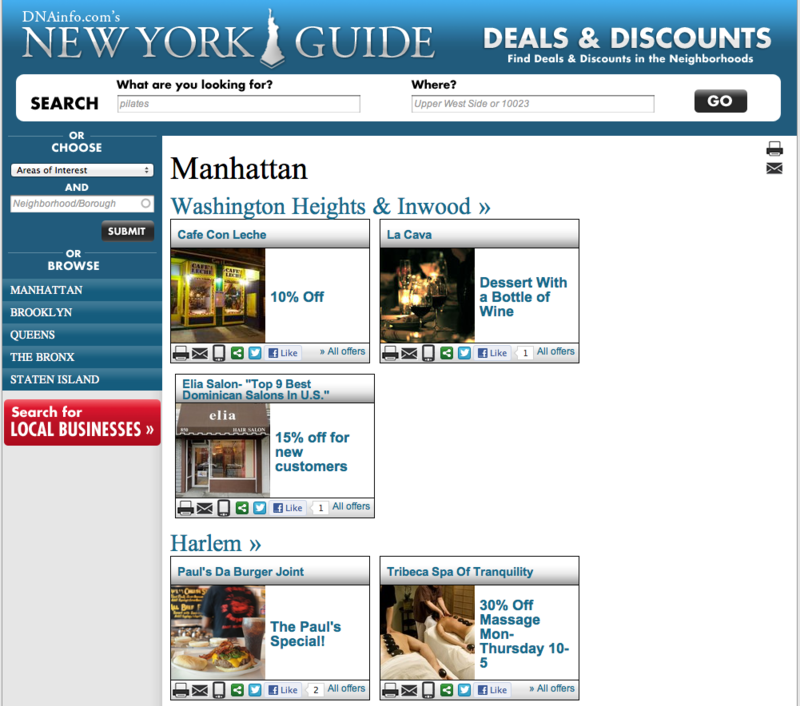 The Guide Website offers visitors an enhanced interface to search through thousands of local listings or to browse by neighborhood, borough or category for deals and businesses of peak interest. Business owners can enrich a free listing on The Guide by purchasing DNAinfo’s premium listing package. A premium listing includes enhanced social media, blog, and email capabilities, slideshow and video integration, extended menu or pricelist info and featured promotion on DNAinfo.